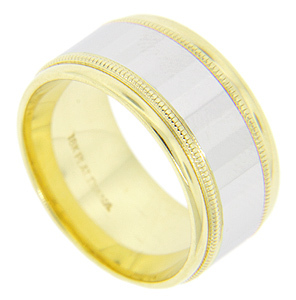 This antique style wedding band is crafted of 18K yellow gold. 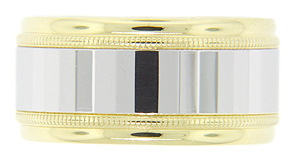 The center strip of the ring is made of platinum and features horizontal rectangles. The wedding ring measures 10mm in width. Size: 7 1/4. Cannot be resized.